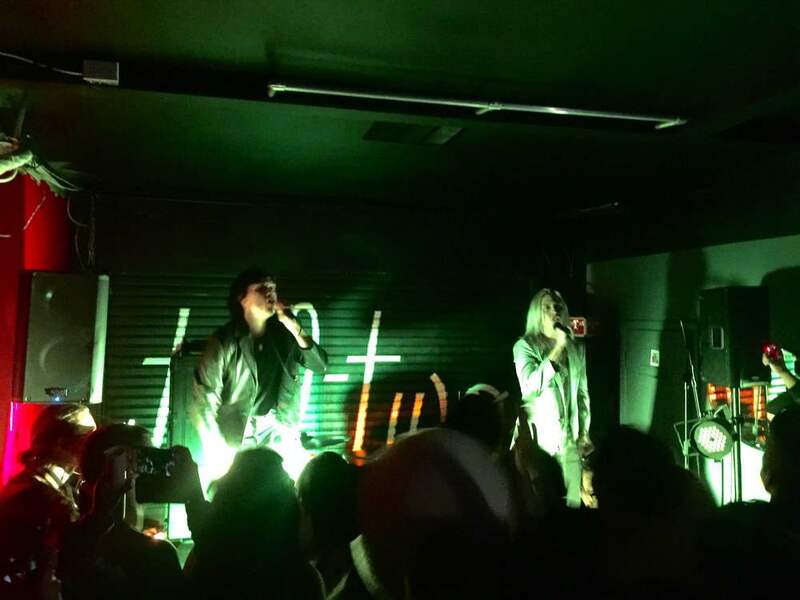 The Shears twins, who constitute conceptual punk band the Garden, paid a remarkable visit to the Til Two Club in City Heights on Friday, May 20. The sibling duo masterfully broke in the venue’s brand new stage, making it a night that will be remembered for years to come. Wyatt and Fletcher hail from relatively nearby Orange County, but San Diego appearances by the two are rare, so it was a noteworthy evening in several respects. The Garden's visit to the Til Two Club in San Diego is one that will not be forgotten any time soon. First, it’s worth pointing out that, like most San Diego venues, the Til Two Club is not an all-ages location. Consequently, Friday’s audience was not representative of the true age demographic of the young band. Closely aligned with Burger Records and Epitaph Records, the brothers’ genre-bending irreverence resonates profoundly with a sizeable, youthful, culture-savvy audience, as a brief survey of social media platforms can attest. In fact, the venue’s management confirmed that it had received an unprecedented volume of callers in the days leading up to the band’s appearance, asking if the show was all-ages. The Garden’s presence and unflappable energy, however, never belied any awareness of the situation, if they were indeed surprised, aware of, or concerned by it at all. The crowd was, nonetheless, about as young as the law of our good land allows, and the energy level never dipped during the 35-minute powerhouse set, which kicked off with “Crystal Clear”, and also included “Jester’s Game”,”All Smiles Over Here:-)”, and “Gift”, all of which are from the band’s fall 2015 album, titled haha. Though the performance had a beguilingly casual feel as the brothers moved fluidly on stage and through the audience (neither the pit nor the crowd surfing ever subsided throughout the set), it was also remarkably tight. It’s hardly surprising that the identical twins appeared to have an uncanny ability to understand and communicate to each other and the audience where they were in the set as they traversed their eclectic landscape, which drew not only from punk, but also hip hop and big beat. Believe it or not, Wyatt Shears is somewhere in this picture. Onstage, the band made a powerful visual and aural impression with their striking good looks (they’ve even made a foray into the world of modeling with Yves Saint Laurent) coexisting with legit, punk rock immediacy. This mix of glamor and grime is perhaps a skeleton key to understanding the Garden’s character and their self-styled, informing credo of “Vada Vada” (“An idea that represents pure creative expression, that disregards all previously made genres and ideals,” as Wyatt writes on their website). 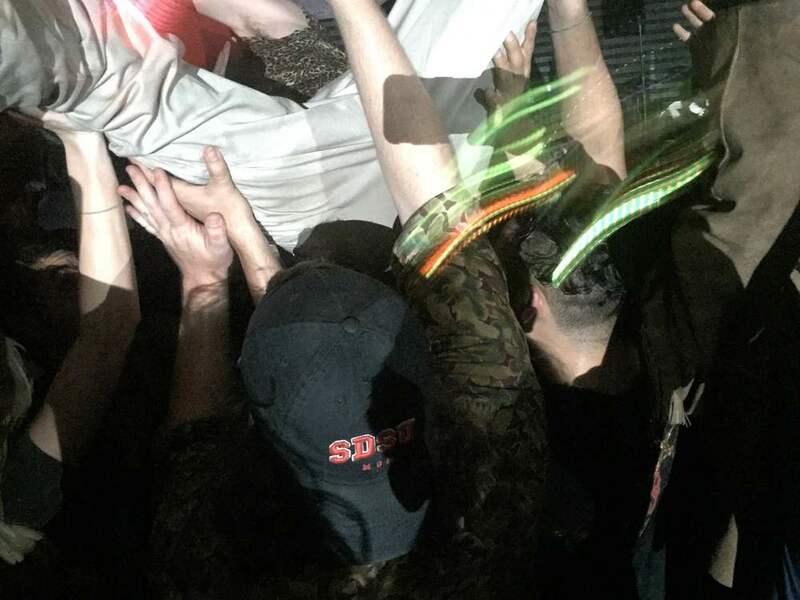 Adding to all this a humanizing sense of humor and fun, the Garden showed an appreciative San Diego crowd why they are one of the most intriguing, multi-layered, and dynamic acts on the scene. Age restrictions notwithstanding, the venue’s own apparent disdain for constrictive allegiance to genre (in recent years, artists as heavy and diverse as Blowfly, Gary Wilson, Too Short, Paul Collins, and H.R. have performed there) played well with the dynamic brothers’ all-out assault on the limitations and constructs of an aging corporate music industry no longer up to the task of categorizing or understanding an act as multi-faceted and forward-thinking as theirs. Wyatt ably covered bass duties throughout, while Fletcher manned the red-hued Vistalite drum kit with often blistering agility, but both were equally at home jumping to the front of stage with quick-fire lyrical barrages. In fact, the welcome unpredictability of the set moved the proceedings along so briskly and pleasantly that cell phones and other distractions had little to no presence during the evening-- a significant testament to the band’s magnetism. For a punk band on a Friday night, the twins brought some heady concept indeed, though brilliantly succeeded in packaging the concept into an audience-friendly, palatable show that must also be described as a decidedly visceral, sweaty affair. After all, it was just a Friday night at a rock ‘n roll bar, and the palpable vibe of the crowd confirmed the night (produced by Bujwah and ListenSD) was special, to say the least. It seems Vada Vada is something better communicated through experience than explanation, and the Garden gave San Diego quite an experience indeed.